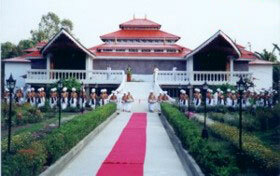 The Chorus Repertory Theatre was established in the valley of small hill state, Manipur that is surrounded by the great nine-folds of mountains guarded by mighty tribes on the top in the easternmost part of India in April 1976. Located on the outskirts of Imphal, Manipur's capital city, Chorus repertory theater�s two-acre campus has been slowly built (and six times rebuilt after disastrous monsoons) to accommodate a self-sufficient way of life, with housing and working quarters for the company. It is now and important regional and national center for contemporary theatre. In 2001, its 25th anniversary season, the company dedicated its first permanent theatre, a 200 -seat auditorium designed by Shri Ratan Thiyam with space for set construction and storage. Thiyam's 1984 Chakravyuha, performed more than 100 times around the globe, thrust the company into the global spotlight. With 'Uttarpriyadarshi', equally acclaimed as a masterpiece, Thiyam continue his examination of the human condition, expanding his explorations of war and power to embrace the search for enlightenment, reconciliation and peace. Equipped with its most outstanding performances in many International festivals in India and abroad, this repertory has able to earn the prestigious "Fringe Firsts Award, 1987" from Edinburgh International Theatre Festival, "Indo-Greek Friendship Award, 1984(Greece), "Diploma of Cervantino International Theatre Festival, 1990(Mexico), and participated in Pan-Asiatico, 1984 (Rome), Indo-Greek Symposium, 1984(Greece), East-west Encounter, 1986 (Mumbai), Dublin Theatre Festival, 1987(Dublin), Festival of India in USSR,1987, Cardiff International Theatre Festival,1987(Cardiff), Glasgow Festival,1987(Glasgow), Mitsui International Theatre Festival,1992(Japan),Toga International Theatre Festival,1994(Japan), Festival d'Avignon,1995(France), International conference on "Culture of Peace: The Experience and Experiments" 1996(New Delhi), Festival of India in Thailand,1996, South Asian Theatre Festival,1997(Bangladesh), 50-years of Indian Independence Day celebration in Srilanka,1997, Festival of Perth,1998(Australia), Telstra Adelaide Festival, 1998(Australia), New Zealand International Festival of the Arts, 1998(New Zealand), Festival Theatre of Nations,1998(Switzerland), 7th International Festival of Scenic Arts, 1998(Brazil), Indian Trade Fair Exhibition at Dhaka(Bangladesh),1999, 50-years of Indian Independence celebration in Nepal,2000. Fall 2000 North American Debut Tour and presented the public performances in the following venues during the entire tour -Kennedy Centre,Washington DC; University of Massachusetts, Amherst, MA; Ordway center for the Performing Arts & Walker Art Centre, Minneapolis/St. Paul, MN; University of California, Berkeley, CA; UCLA performing Arts, Los Angeles, CA; University of Arizona, Tucson, AZ; Duke University, Durham, North Carolia; Brooklyn Academy of Music, New York. 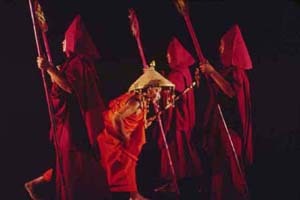 The Company recently participated in the BeSeTo International Theatre Festival, 2001(Japan) and Barbican International Theatre Event (BITE:01), London (United Kingdom), 2001. The repertory has also been performed with great success in various places and cities including- London, Delphi, Kalamata, Thessaloniki, Kavala, Athens, Yaroslov, Leningrad, Minsk, Barisova, Southampton, Omag, Amsterdam, Gainsborough, Bradford,Querentaro, Guanajuato, Cruz-A-Zul, Guaquil, Quito, Havana, Manizales, Cuba Bogota, Lima, Thimpu, Haa, Bangkok, Chiang Mai, Wellington, Zurich, Kathmandu, Tokyo, Toga, Toyama, etc.